I Heart Fluff - All About Cloth Diapers: Save Even More Money with Cloth Diapers! Save Even More Money with Cloth Diapers! I've already talked about how much money you can save by switching to cloth diapers even with a start up cost of $500. But many people make the switch to cloth without spending near that much! Read on to learn about some of the most popular ways to save more money with cloth diapers. Because cloth diapers can last for years, you can almost always find gently used diapers for sale somewhere. Some of the most popular sites for used cloth diaper sales are diaperswappers, Spot's Corner and there are many facebook groups that focus only on buying, selling and trading (b/s/t) used diapers. Many cloth diaper stores also offer a gently used section. You can usually buy an entire stash of gently used cloth diapers at 50% or more off the retail price. Yeast and bacteria can live in cloth diapers. If possible, try to bleach any microfiber inserts and wash well before using. You may also need to sanitize the rest of the diapers and inserts. You can find a good article about sanitizing cloth diapers at PinStripes and PolkaDots. Many gently used diapers have already gone through some wear and tear so they won't last as long as brand new diapers would. You may have to replace some of the used diapers before your child is potty trained. Some people prefer to only buy gently used diapers from family or friends while others decide not to buy used diapers at all. If buying used diapers isn't for you, keep reading for other ways to save money. 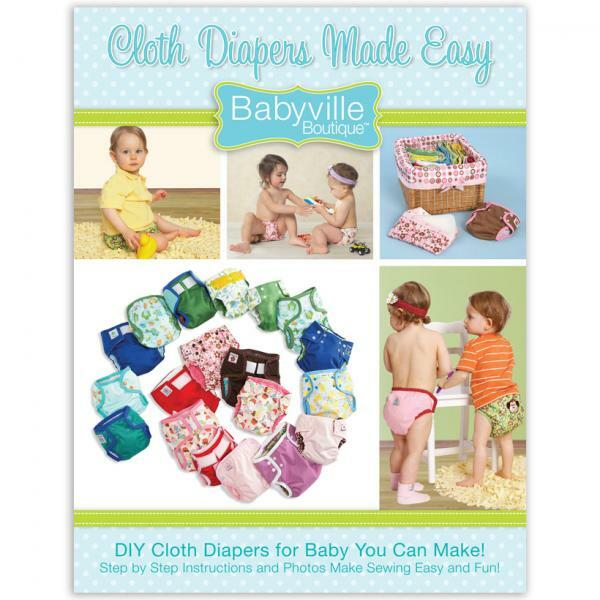 If you are handy with a sewing machine or serger, you might want to try making your own cloth diapers. As cloth diapers and diaper making becomes more common, the materials are becoming more accessible. Babyville produces a whole line of diaper making supplies that can be found at many JoAnns and Hobby Lobby stores. Fabric.com now offers a whole Diaper Central category. Wazoodle and Nature's Fabrics are both sites that are dedicated to diaper making. You can make cheap diaper inserts with the microfiber towels found in the automotive section of Walmart and Target. There is a bit of a learning curve when making your own diapers. Just like premade cloth diapers, not all diaper patterns will work with all babies. So you might have to adjust or change your pattern a few times before you find what works for you. Also, some diaper materials can be expensive. Diaper manufacturers are able to buy their materials in bulk which is a lot cheaper than buying a yard or two at a time. And, they are able to pass that savings down with the cost of their diapers. Prefolds and flats aren't hard to use, but they aren't as easy to use as pocket or AIO diapers so they can be intimidating to some people. It can be harder to get family and caregivers on board with cloth diapering if they have to use prefolds or flats. Have you done any of these things to save money with cloth diapers? ***CLOSED"***Why I (Heart) bumGenius! and Diapers Etc.